I mentioned last week that I had a couple of watermelons left to dispose of and I thought I might do something a little different with them. A lady from church had given me a clipping from the newspaper that was of watermelon recipes. I thought that the watermelon pudding tart sounded particularly interesting. Instead of making a tart from it though, I chose to just make the pudding in cups. Of course I added a little vanilla to the recipe because I can't leave well enough alone. We had it for dessert Tuesday night and it was interesting. I think it would have made a nice ending to a light summer meal. The texture was beautiful but it was not really sweet enough for me; it would have been perfect balance though with the added sweetness of the graham crust and whipped cream had I used it in a tart. I made another batch using a tad more sugar, vanilla again, and a little mint extract. It was so much better the second time around. 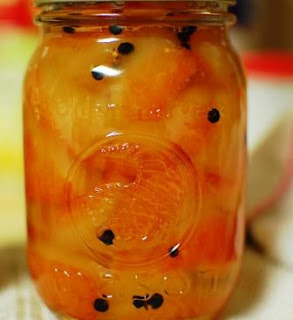 I had another pickled watermelon rind recipe that I wanted to try, this time from Paula Deen. So far, I have liked all of the recipes for rind pickles, but these were definitely in the top two batches. The pop of the peppercorns was really tasty. I didn't put as much sugar as it said because I didn't want them candied, just pickled. You have got me drooling over this recipe! It looks so good, sure wish I had some. Thank you so much for sharing with Full Plate Thursday. Hope you are having a great week and come back soon!